Puerto Rico FC earned its first win of the season in Week 11 and forward Giuseppe Gentile led the way. He scored and assisted another goal in the victory. Gentile, though, wasn't the only player to make a big impact in a win. Dylan Mares played a crucial role in Miami FC getting a victory and Dejan Jaković put in a strong shift to help the New York Cosmos earn a road win. GK: Brian Sylvestre (North Carolina FC) –The young shot-stopper may have come out on the losing side to the New York Cosmos, 1-0, but he was impressive. He made a total of five saves to keep North Carolina in the game until the final whistle. DEF: Mason Trafford (Miami FC) – He made nine clearances in the 1-0 win over Jacksonville Armada FC and also helped maintain possession for the visitors, completing 74 of his 80 passing attempts. DEF: Nana Attakora (San Francisco Deltas) – The Canadian international made seven clearances and won five duels in San Francisco’s 2-2 draw with Indy Eleven. DEF: Colin Falvey (Indy Eleven) – The Indy captain was bloodied in the contest, but he wouldn’t quit, returning to the field for the second half. He won four duels as well as making three clearances and three interceptions against the Deltas. DEF: Dejan Jaković (New York Cosmos) – The Canadian international won all three of his tackles and made three clearances and three interceptions in the Cosmos’ win. He had a key intervention late, winning the ball near his goal line during a dangerous chance for the home side, that would have been the equalizer had he not won the ball. MID: Dylan Mares (Miami FC) – The midfielder provided the crucial touch in Miami’s key win over Jacksonville, heading home the lone goal in the victory to keep the club in first place in the Spring Season. MID: Juan Guerra (New York Cosmos) – The Venezuelan international scored the lone goal in New York’s victory. He also created two chances and won five duels in the midfield. MID: Kyle Bekker (San Francisco Deltas) – The Canadian international assisted on the game’s tying goal for the Deltas and was dynamic in attack. He created three chances overall for San Francisco in the draw. 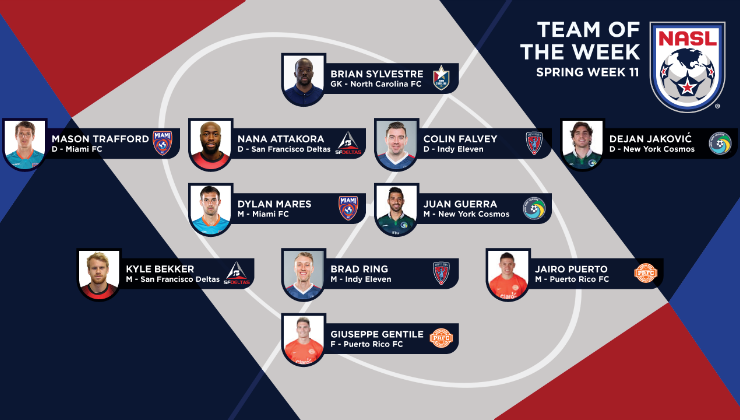 MID: Brad Ring (Indy Eleven) – The veteran struck from distance for Indy to help the club earn a point in the road contest. He also won five duels and made four interceptions. MID: Jairo Puerto (Puerto Rico FC) – The Honduran international put the exclamation point on the club’s 3-0 win over FC Edmonton with his first goal for Puerto Rico FC. He also won six of his eight duels and both of his tackles. 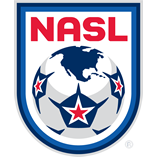 FWD: Giuseppe Gentile (Puerto Rico FC) – The NASL veteran opened the scoring for Puerto Rico and then added an assist just three minutes later in the big win over FC Edmonton. Gentile was also named Player of the Week for his efforts.